Time Capsule to Become Local "Edge Router/Server?" "Cult of Mac‘s source claims to have the inside info on just how Apple’s new iCloud service will work, and they’re saying Apple’s Time Capsule (Airport Extreme + hard drive combo) will serve as its local hub." We'll see real soon if there is any basis to the all the rumors swirling around about Time Capsule evolving into more of an "edge" router/server for iCloud (like Akamai, for example). Personally I like the idea of updates, etc; happening "off-box" to be cached for multiple machines. In a bandwidth metered environment, I hate having to download the very same content on multiple Macs. Download Once, Use Everywhere (please). 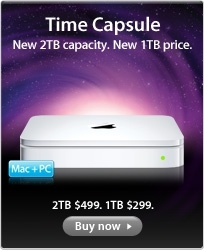 Secured data in the cloud, and on an edge device like a time capsule would be a good solution. Stay tuned, all will be revealed, I hope!